Summer fishing is continuing with small striped bass very present; trout and catfish are still active with a few largemouth reported. The reservoir is currently storing 115,900 acre-feet of water, 72 percent of capacity. Pumping has resumed and will continue through into September. The water temperature is 69 to 70 degrees. Our water clarity is fair to good with the cooler weather and the winds breaking up much of the algae. We’ve planted quite a few fish lately. Warm water temps have prevented us from planting trout since July 13. But on Aug. 18 we did plant 6,000 three-to-four inch largemouth bass; 2,000 fingerling bluegill and 2,000 fingerling redeared sunfish. On Aug. 11, we planted 1,000 catfish and expect to plant some more this week. Despite the warmer weather, we’re still seeing anglers catching trout, especially in the morning. We’ve planted 27,500 pounds of trout this year. The windy weather pattern is settling down, but we still see plenty of windy days. If you are looking to rent a boat, it is a good idea to call ahead at (925) 371-2628, check current conditions, or look at a forecast for the Livermore-area that is pretty close to our weather. We’re seeing rattlesnakes regularly, so be sure to check your surroundings. The John Muir Interpretive Center is open from 9 a.m. to 4 p.m. on Saturdays and Sundays. Our summer hours are 6 a.m. to 8 p.m. with boats due in by 6 p.m. In September, our hours will be 7 a.m. to 7 p.m. and boats due in by 5 p.m. We will be open Labor Day with our regular September hours. Fishing for trout continues to be good, even with the increased water temperature. They are being caught in South Cove and Oak Point as well as Peninsula Cove. The baits of choice for shore anglers are garlic scented PowerBaits, nightcrawlers or Kastmaster lures. Trout average a pound and a half but range to over 5 lbs. Due to warm weather, our last trout plant was July 13th. We hope to plant in the coming weeks. Light tackle is important for catching trout with 4-6 pound test being plenty. Trout fishing is still decent, especially in the morning, with limits being caught from around the reservoir and a number of 2’s and 3’s showing up. With boats, we are getting reports of fish being caught in Howden and Peninsula coves. From the shore, the most popular bait has been by garlic scented PowerBaits followed by nightcrawlers and Kastmaster lures. There is no need for line heavier than 6 lb test. Fish are still coming out of South Cove and from past the Rock Wall. Most anglers were focused on stripers or trout although there still are many sightings near the boat dock and adjacent fishing pier and along the Rock Wall. We planted 6000 3-4 inch bass on August 18th. Senkos have been seen catching some nice fish in that area. Keep in mind that largemouth need to be 12 inches to be kept. Please release any big largemouth bass you might catch. They are the future of largemouth bass fishing in the reservoir. If you catch any of undersized fish please release them gently and allow them to grow up. Shakers continue to be the main action with striped bass. We are still seeing many undersized fish caught for every keeper. The fishing pier by the Marina has been particularly good. From shore, cut anchovies or shad is the bait of choice. Just a reminder, stripers need to be 18 inches or more to be legal. We are starting to see more dead undersized stripers around the dock as anglers are being careless with how they release the undersize fish. Please release the small fish as quickly and carefully as possible. They are the future of our striped bass fishery. 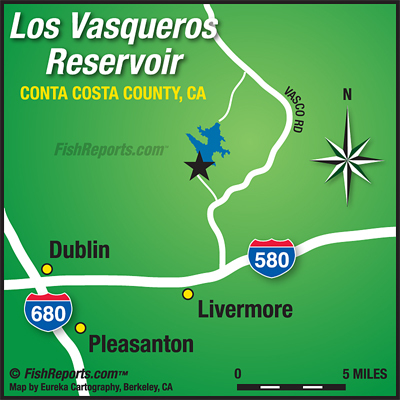 Catfish are hit or miss with fish being reported out of Cowboy and South Coves. As the water warms we look to see more fish being caught. 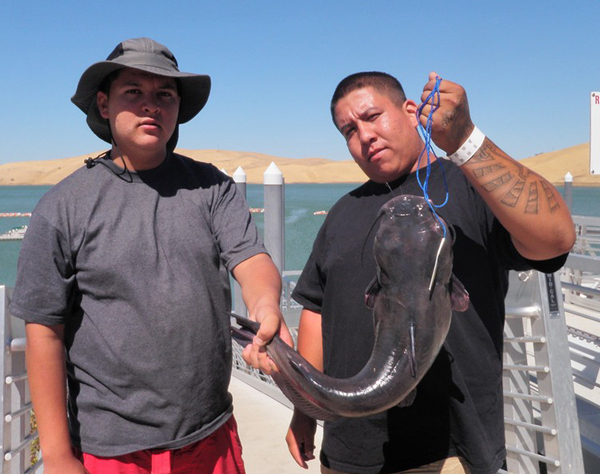 There was a 1000 plant of catfish on August 11th from Lassen. We will be planting catfish this week. For those wishing to target catfish, nightcrawlers and chicken liver are the best choices of bait. We encourage and appreciate the release of any monster catfish (15 lbs plus).